Welcome to the Rock N Roller Crew. This litter of pups is named after our love for music. 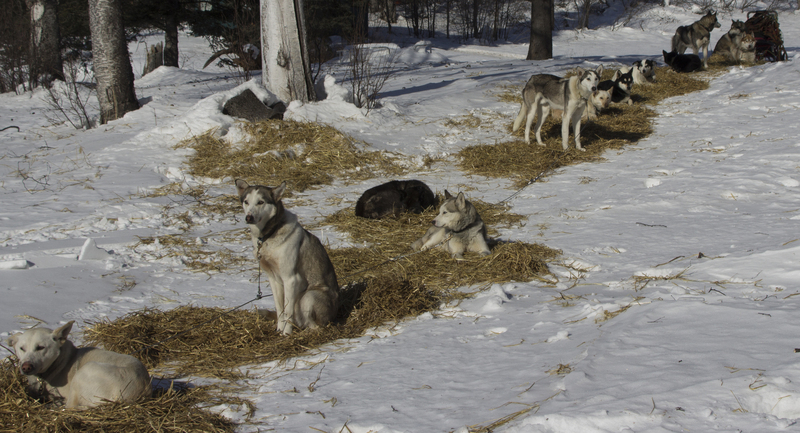 This group is the future of Team Ineka and was bred specifically for our expeditions. Say hi to: Hendrix, Jazz, Grohl, Cobain, Sully and Jagger! Hi my name is Lock, I’m part of the Nightmare Crew. We are named after the Tim Burton movie “Nightmare Before Christmas” We live up to our names! At the end of the season last year we started training on the sled. I’m still not sure that I like running on frozen lakes or overflows. Last season while running on one of the lakes there was some open water and I got pretty freaked out. 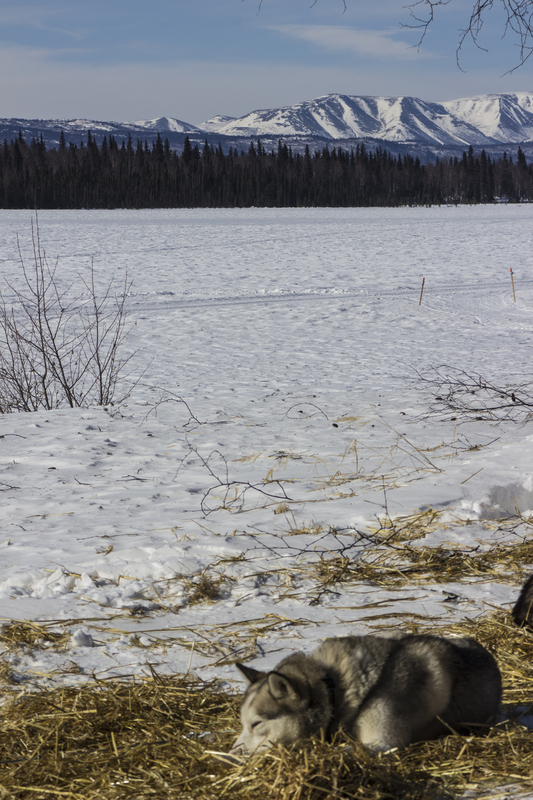 I was running with Ms. Michele and she literally reached over the sled and scooped me into the basket while we were still running because I slipped my collar out of fear of the water. She secured me in the basket and once we got off the lake she put me back on the line and I ran home. Now I still am nervous around open water but I’m learning this fall that puddles are okay. 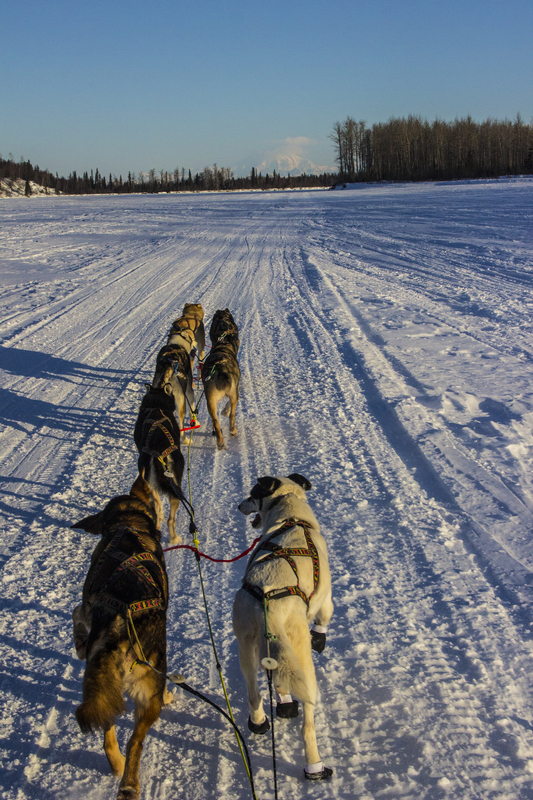 On the 2017 Winter Expedition course that we taught at the University of Alaska Anchorage, we took three dog teams of 8 to 10 dogs each. 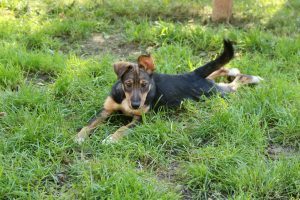 For most people when they see a dog yard they may seem quite different than what they are used doing with their own dogs. 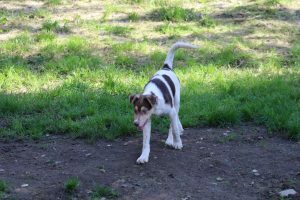 Once you look a bit closer you might find the yard is set up this way so that the dogs can foster healthy relationships and a social setting that provides ample exercise and freedom of movement. Our dog yard is pretty social. We often keep groups of siblings together and dogs that get along well with their favorite friends close by. These dogs thrive on social bonds and family just like we do. 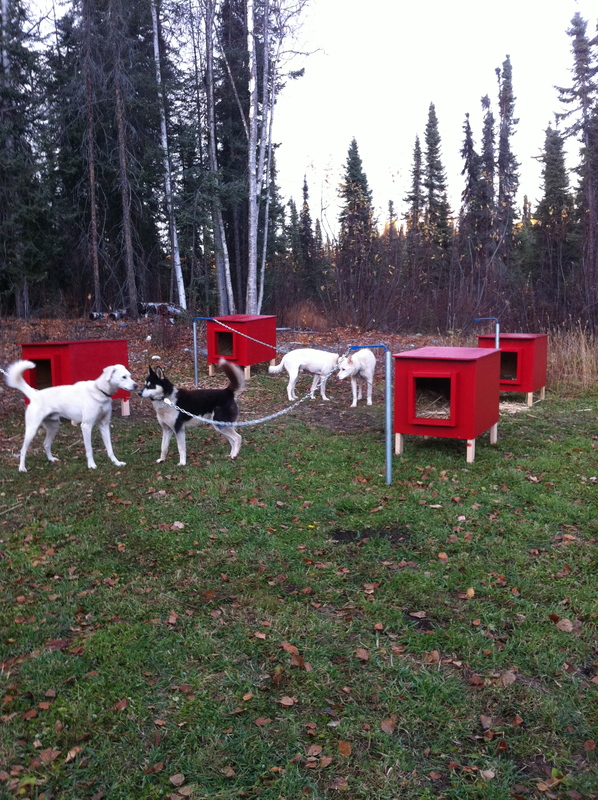 Our dog yard of 38 sled dogs needs to be specifically organized to ensure that each dog’s needs are met. 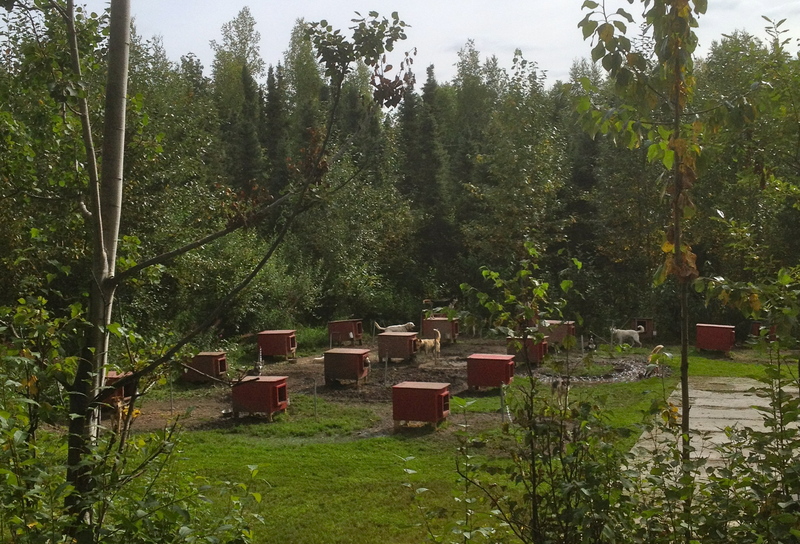 It is not uncommon to see a dog yard set up just like ours throughout the sled dog world. Most dog yards use a tether system with individual houses for each dog laid out in rows. Our dogs are kept at their own house where they can enjoy their private space. The length of the chain is determined by two factors. 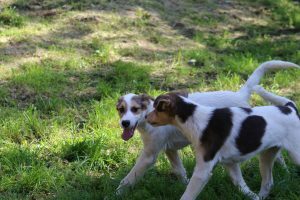 The first is to give the dogs tethers long enough so that they can interact and play with their neighbors in the yard. 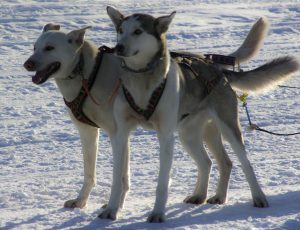 The second is to ensure that the tethers are not too long that they present a hazard to the dogs’ safety. We want to make sure that there is no chance of getting tangled with another dog. The houses themselves are also carefully thought out. Our houses are build with a small entrance door that provides shelter from the elements (hot summer sun, rain, and cold winters). Our houses have a flat roof and, just like Snoopy this is the dog’s favorite place to be. You will often see our dogs perched on top of their houses catching some afternoon rays or watching the ravens and magpies dance around looking for leftover food crumbs. We use straw in the houses for bedding and warmth. 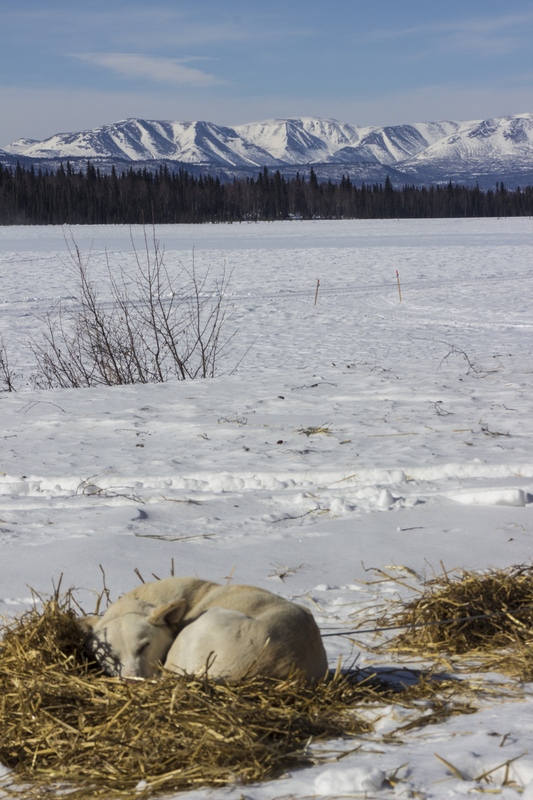 It is a very exciting time for the dogs when it is straw day. They all love having new straw in their houses and you will often find most of them burrowing their noses in it to make a comfy bed in their houses when the straw is delivered. Our rule is we add new straw for every 10 degrees in temperature change. So if it is -20 we have added straw at least four times. 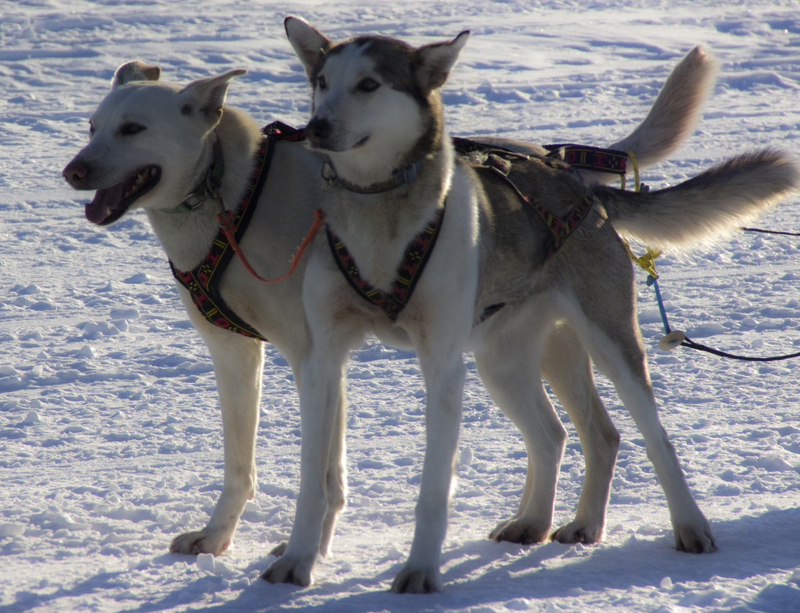 Our dogs need a lot of mental stimulus especially in the summer when it is their vacation and they are not busy pulling sleds. 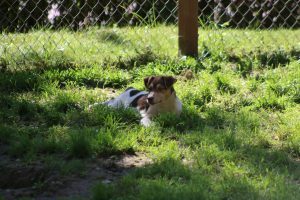 In the summer months we often will move the dogs around to meet new friends in the yard and free run and play in our yard up by the house. We also have several pens attached to our kennel building and we use these for when females are in season, and on the rare occasion one of the dogs is sick or injured. In our dog yard we do try to keep the boys separated (for the most part) from the girls. 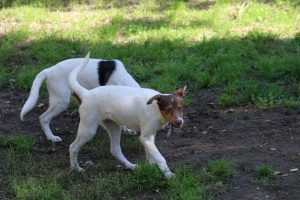 The main reason we do this is to prevent accidental breedings and to keep the young male’s hormones in check. Often they act just like teenagers when a pretty girl is around. Most of our dogs are very social and the “pet me dogs” are closest to the perimeter. All of our dogs are friendly but some are more shy than others. These shy dogs need more personal space and are housed toward the back rows. 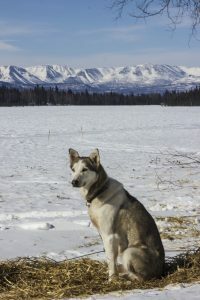 Our dog spend eight months of they year in harness and most of them will run well over 1,500 miles. During the autumn months we spend lots of time on muscle development and conditioning, similar to how you would when you are trying to get into shape to run a marathon. We always feed twice a day at Team Ineka. 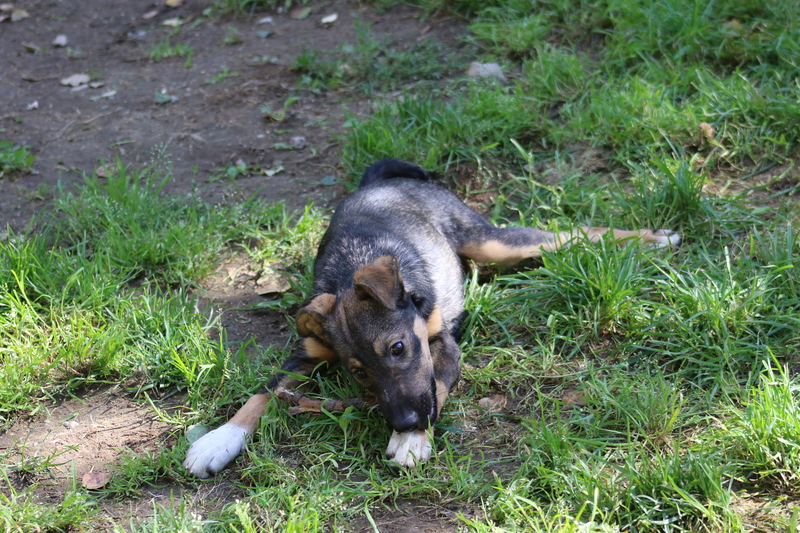 Each day we feed about 40 pounds of raw meat and 10-15 pounds of kibble mixed with water. 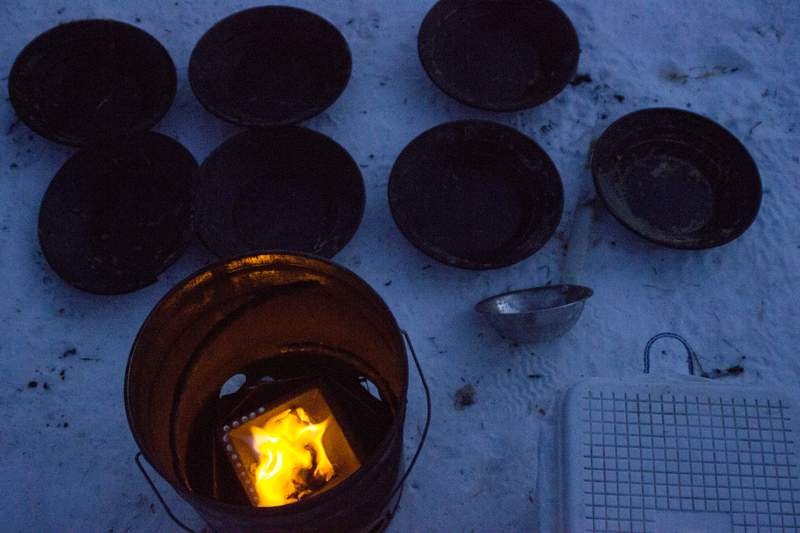 Each dog is fed at their house using a ladle and a 5 gallon bucket. 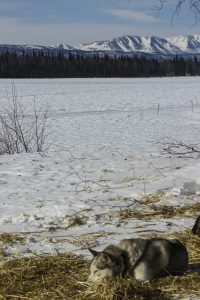 In the winter we will often triple their calories and feed lots of fish, beaver, fat, chicken skins, and moose. We have four large freezers in the kennel building an two large cans of kibble. We have a food bill of about $2500.00 a month! Our daily chores take 3 or 4 hours every day, 365 days a year. This does not include running the teams. We are interacting with the dogs the whole time. 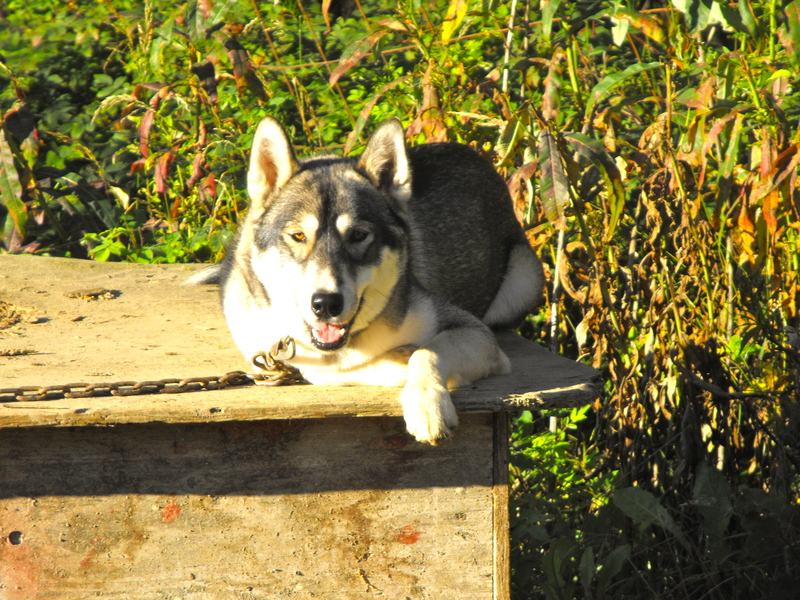 We spend time each day petting, grooming, and you will often find us just sitting on top of a dog house talking to one of the dogs. We try our best to keep the noise to a minimum. 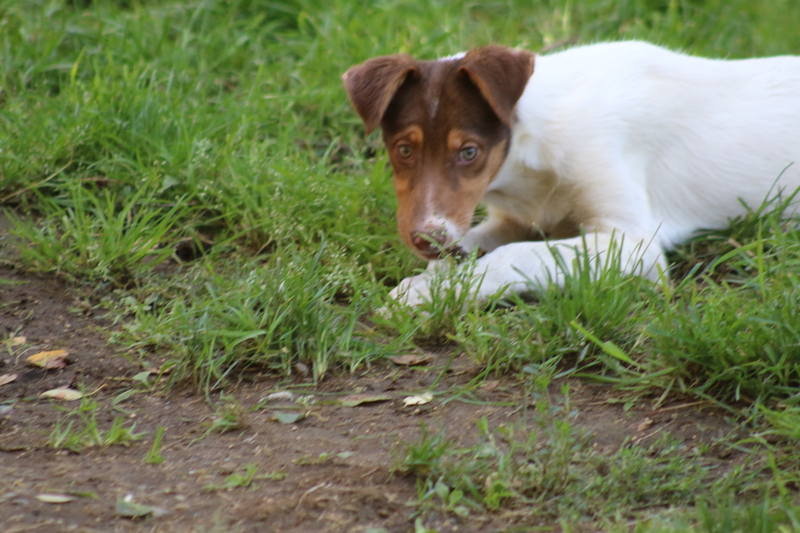 Usually when the dog yard is loud something exciting is happening. If we are hooking up or feeding the chaos is at full volume, other times, especially in the middle of the night the sound of an excited dog yard rouses us out of bed and down to the yard to check things out. On more occasions than we would like we have chased off a big moose or a pesky fox that likes to hang around. Since we do have a few neighbors that are not mushers we try not to rouse up the dogs past 10 pm and before 7 am. Dogs will be dogs however and there is nothing more cool than when the dogs sing together under a full moon. 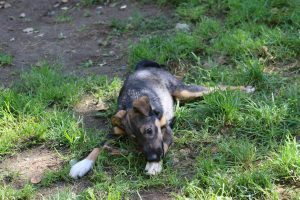 People always comment on social media that what we do is cruel and inhumane to the dogs. I beg to differ. We spend hours with our dogs. It is our full time job and someone is here almost 24 hours a day. 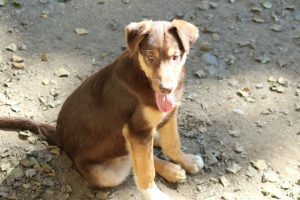 Our dog’s care is top priority and we spare no expense or time. If you think about it, do you spend all day with your dogs? What are they doing while you are at work? 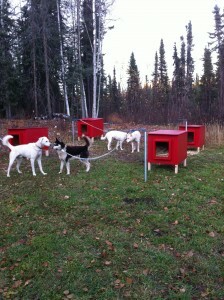 A sled dog kennel is a dynamic environment with something always going on. We are constantly thinking of ways improving. 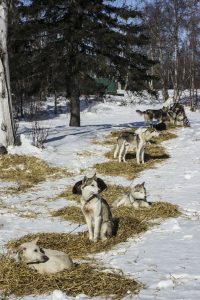 The next time you see a sled dog kennel take a look around, you may see things differently now that you know what to look for. Hi my name is Skellig of the WaG Crew! I have the most unique name of all of my teammates! Not only am I named for a type of Kerrygold cheese the cheese itself is named for the Great Skellig Island in Ireland. I think it fits me perfectly with my strawberry blonde coat, not so perfectly pricked ears and button nose!